The Drummond Will receives the first ever super nova review, this one is well beyond stars. This British comedy is one of the best for many years. It is at its heart a very black comedy, but so well done that you never really at any point stop to wonder whether or not you should be laughing. 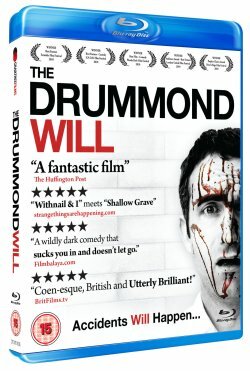 If you look up The Drummond Will you will find awards coming out of its ears, and once you watch the film, you will be in no doubt as to why it won any of them. The storyline is mundane enough, as is often the case with British comedy, but after the first ten minutes or so it really doesn't matter. It is incredibly compelling and most entertainingly of all, you begin to try and predict what will happen next. This is where the comic timing of the writer and director Alan Butterworth makes itself evident, there are several moments in the film that are timed to the second (I would love to tell you what they are but I don't want to spoil it!). The script is brilliant and added to most magnificently by the performances of the lead actors, Mark Oosterveen (Marcus Drummond) and Phillip James (Danny Drummond) who are fantastic as the estranged brothers brought together by the death of their father and the unexpected inheritance of a house and its contents. There are quite a few moments in this film that will make you jump or laugh and it has various twists and turns, but above all it is a thoroughly enjoyable romp from start to finish, with a few disturbing bits just to add to the experience. I would totally recommend this film to anyone over the age of 18, a brilliant way to spend a night in and one that will definitely be watched quite a few times in this house. Absolute must own!